A small set of stereo speakers for iPod owners that produce good sound from a compact package and at a reasonable price. 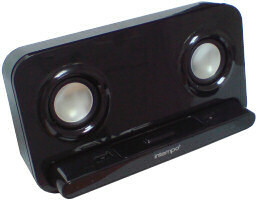 Intempo produce a range of iPod speaker systems, along with a varied range of other audio products. The IDS-05 is a mid-sized unit at 23x13x9cm (width x height x depth). Sound is produced by combination of three speakers - two stereo 3W, 2" mid-range speakers to the front and a single, centrally mounted 9W, 3" sub-woofer to the rear. The speakers are not covered with any protective grill. While I didn't find this a problem with the front speakers I did find that each time I picked it up my fingers naturally got hold of the sub-woofer - something to be careful of! The speaker arrangement produced very good sound for the size and price of the device. Not up to the standard of the Altec Lansing iM600 I recently reviewed, but at around half the price still very good. I was very pleased to find that separate bass and treble controls are provided (so often missed these days) and I found the sound improved with the base setting increased above the default. There was minimal distortion or 'rattling' at high volume - and the maximum volume was both impressive and clear from a device of this size. Power is via a main adaptor, consuming around 15W in operation. There is no option for battery power so this is very much aimed at a static mounting point for your iPod. The only controls on the device are two buttons controlling volume (up and down). To the rear of the product, as well as the sub-woofer, there are power, line-in and USB. Line-in allows you to use and external sound-source such as radio or mobile phone or non-dockable iPods such as the shuffle. The USB connector allows you to connect your iPod to your computer without having to remove it from the IDS dock. All other controls for the device are on a separate remove-control. The remote is a good size - not so small you'll never find it - and not so large it's obtrusive. Controls from the remote include volume, bass, treble, track-selection and access to your iPod menu - although you'll probably have to get pretty close to see the display! The package also includes a useful 3.5mm line-in cable, a very short manual (which really isn't needed!) and a set of six iPod cradle adaptors. Pricing for the Intempo IDS-05 is around £50 and is available in either black, white or silver to match your d	cor! Amazon have the black for £44.99 and the white for £44.99, including shipping. I couldn't find the silver variant available. i also have intempo ids05b. please will some one just till me the sound IC part no. because my intempo has burnt the ic. it is started CD.... but due to ic is burnt the number is also burnt. so plz some just open their own intempo and inbox me the IC part no.